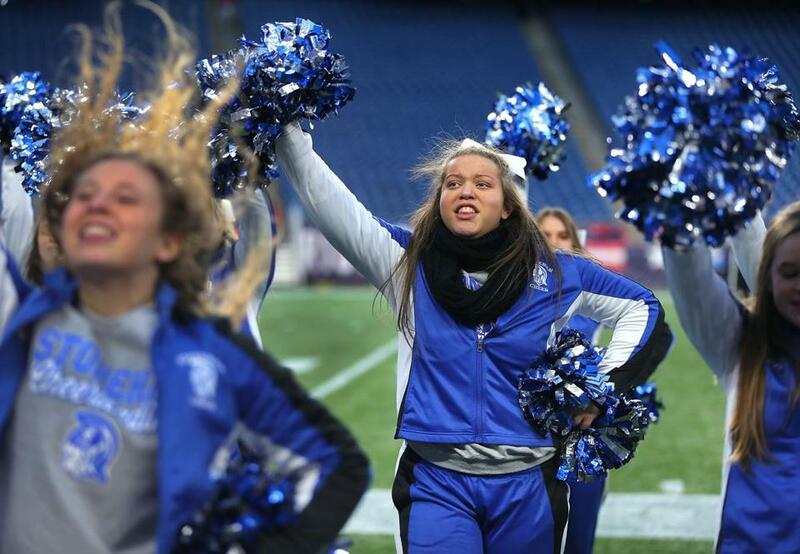 Autumn Bardell cheered on the Stoneham High football team Saturday at Gillette Stadium. Sign up for our Varsity News newsletter. Stoneham High School’s gymnasium was alive with excitement over the football team’s upcoming Super Bowl game at Gillette Stadium, a pep rally this past week held against the cacophony only a room full of excited students can create. The team’s players were awash in applause while the school’s cheerleaders pumped up the crowd, the buildup to a Saturday afternoon game against Old Rochester painting a perfect picture of local sports spirit. As cheerleader Autumn Bardell took her turn spinning cartwheels down the mat, a different portrait of community spirit was on display, and this one carried a message far beyond the value of wins and losses. Bardell, a 16-year-old junior at Stoneham, has Fragile X syndrome and is on the autism spectrum, a combination of diagnoses that should make it impossible for her to perform in such a loud, distracting environment in front of such a large, rowdy audience. But thanks to a community that has come together in a way that defines empathy and embodies compassion, Autumn Bardell routinely conquers her cheerleading challenges, and is an integral member of the team who never misses a practice, knows every game-day cheer, and has even submitted her letter of consideration to be a captain in her senior year. 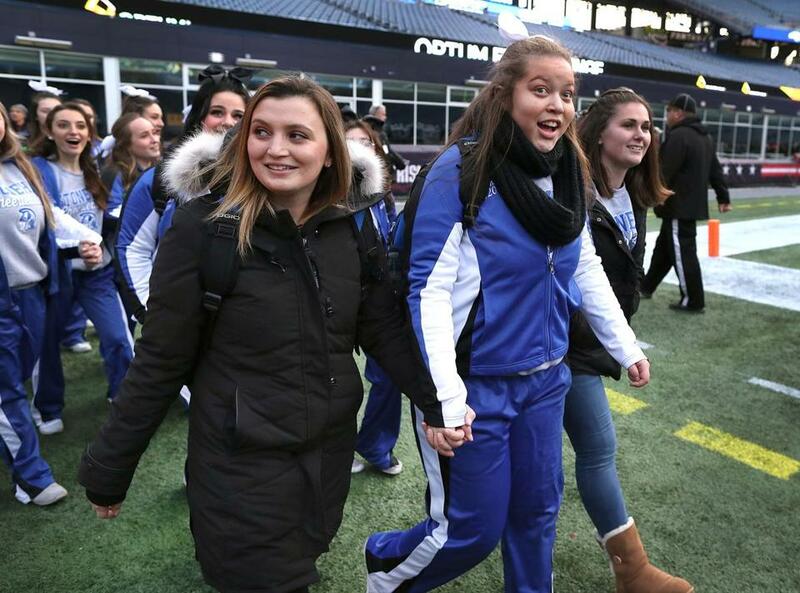 That she was able to take the Gillette Stadium field with her Stoneham teammates was a moment worth celebrating, a powerful reminder that our truest, most enduring victories have little to do with a game’s final score but everything to do with life’s most lasting connections. Stoneham cheerleader Autumn Bardell (center) walks with Jackie D'Amato (left) as they enter Gillette Stadium before their team played Old Rochester in the Division 6 Super Bowl. Your weekly look at the top high school sports stories. So forget for a moment all those dispiriting stories of exclusion and bullying that clog our daily newsfeeds and revel instead at what’s happening at Stoneham, to appreciate what it looks like when the system works, when parents who advocated for their daughter met an administrator who was willing to hear them, when a teacher with unique coaching qualifications stepped up to help one special student, when a fellow Stoneham cheerleader stepped in to become another’s most special friend. 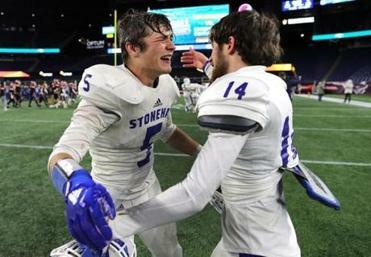 Eight teams claimed a state championship at Gillette Stadium. Autumn has known since about the age of 3 that she wanted to do them. But as she grew up, as her parents Kathleen and Rob volunteered for the local youth football program while various siblings among Amber, Samantha, Robbie, and Bryce were involved in local sports, there was no outlet for her interest. So she took her store-bought pompoms home and made up her own cheers. But Pignone, also a lifelong Stoneham resident and longtime youth football volunteer, had bigger plans, ones he knew he could help affect from his AD office at the high school. 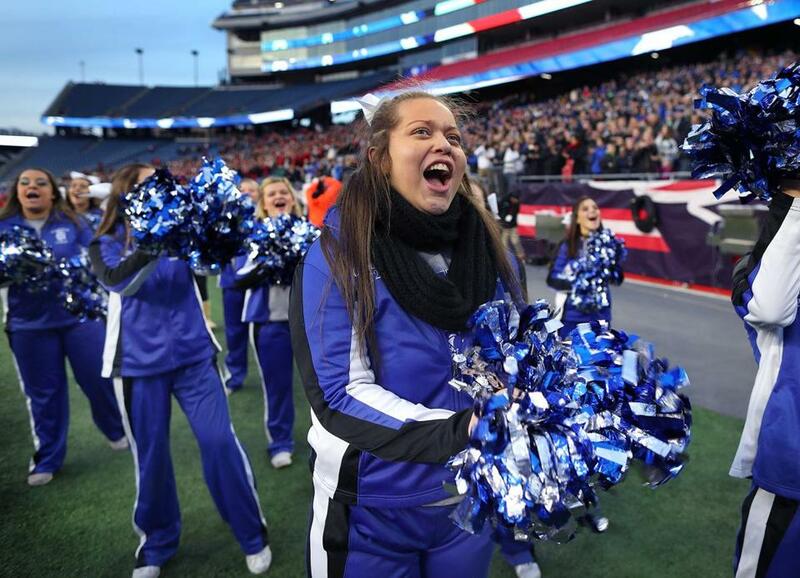 Stoneham High cheerleader Autumn Bardell performs with her teammates at Gillette Stadium as her team played Old Rochester in the Division 6 Super Bowl. It takes a village. Enter Gabby Owens, who was a sophomore on the cheerleading squad when Autumn arrived for her tryout. “I remember we were told we were going to have someone with special needs on the team and I thought, ‘Wow, that’s so cool to see someone get a chance to do that,’ ” said Owens, now a senior who was cheering her final high school game on Saturday. “That’s not an easy thing. The first day she came in, and I went up to her, explained my name and stuff, and she happened to be standing next to me in line. I saw she was having trouble learning the new cheer. I knew them, so I started to explain it to her a little extra, the extra time the coaches couldn’t take in a room of 40 other people. No surprise Owens is eyeing a nursing program when she heads off to college next fall. She already gets the No. 1 requirement — caring for others. She also understands that she learned as much from Autumn as Autumn did from her, that courage comes in many forms, that leaders don’t always have to be at the front of the line. 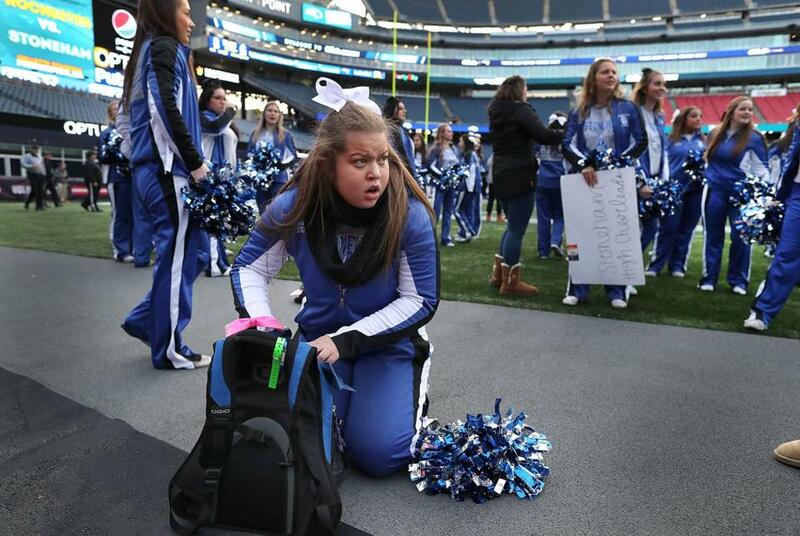 Stoneham High cheerleader Autumn Bardell gets her gear together at Gillette Stadium as her team played Old Rochester in the Division 6 Super Bowl. This is what Autumn wrote in her application for captain: “I want to be a captain my senior year because I like to help people and I can be a good friend and role model for other cheerleaders. “Many of you know I have autism and that means there are many aspects of being a cheerleader that are obstacles for me. The uniform on game day feels like I am constantly being squeezed tight. All the yelling from fans, noise on the field, and everyone talking makes it very hard for me to concentrate. Because of Fragile X, I have very low muscle tone. Cheers, cartwheels, and endurance are always a struggle for my muscles to follow through and to keep up with me. “However, because of friends and leaders like Gabby, Diana [DiTullio], and all of you, I realized I could overcome all of that just to have the best time of my life on the sidelines with my team. I discovered that my cheering encouraged our football players and I loved watching them win every week. Tara Sullivan is a Globe columnist. She can be reached at tara.sullivan@globe.com. Follow her on Twitter @Globe_Tara.